They have clean blue sea water with small waves suitable for swimming or water sports such as banana boat or jet ski. 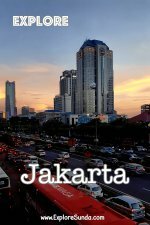 The location is near Jakarta, approximately 120 km, including 95 km via Merak toll road. Hence, we can go for a one day trip or spend 1-2 nights there. Sunda west coast starts with Anyer, going to the south we will pass Karang Bolong beach and arrive at Carita beach. If we go further south we will arrive at Tanjung Lesung beach then Umang island in the farthest southwest, near Ujung Kulon national park. They are the landmarks of Sunda west coast, but along the way we will find many public beaches. 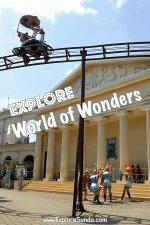 We only need to pay the entrance fee then we can park all day long, have a picnic, take a ride of a banana boat or rent a jet ski. If you want to spend more time, there are many hotels along these beaches. Generally these hotels will be fully booked during weekend and almost empty during weekdays, therefore their published rate during weekends are unbelievably expensive. Unfortunately some of them are not well maintained. Therefore, it's better you see the room and the hotel surroundings and facilities first, if you like it you can bargain the price. Don't book the rooms by judging from the pictures you see in the brochures or internet, because they could be worn out by now. Alternatively, book a room in a brand new hotel. Patra Jasa hotel, one of the pioneer hotels in Anyer. Each cottage of this hotel consists of two rooms with a connecting door. Every cottage surrounds by gardens leading to wide sandy beach of Sunda strait. 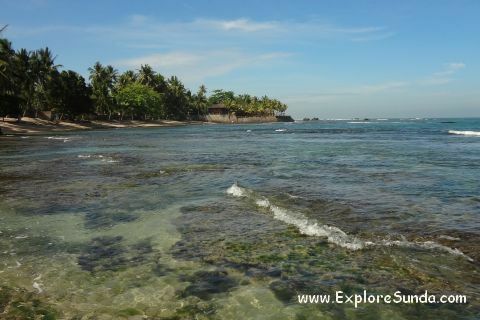 We, at ExploreSunda.com, think that this hotel has the best part of Anyer beach, since sandy beach in this area is scarce. Mambruk hotel, the location is right before Patra Jasa hotel, but it doesn't have sandy beach. It has a swimming pool overlooking the sea though. We also can rent a jet ski or banana boat, play tennis, table tennis, footsal (mini soccer), flying fox and outbound games. Hawaii A Club Bali Resort. A relatively new hotel, the location is near Carita beach. It doesn't have sandy beach, but it has water park in its backyard. Acacia hotel, a brand new hotel, just opened during our trip in October 2011. As you may notice, although most hotels are located in the sea side, only some of the hotels have beach in their backyard. Other parts of the beach are covered with rocks. These rocks are volcanic rocks that came from the eruption of Mount Krakatau in 1883. Other hotels are relatively small. However, some of these hotels provide kitchen in every room or barbeque area in the yard, so we can cook the fresh seafood we bought from fishermen. Other advantage of staying in small hotels is that we will meet men walk in to the hotel yard selling fresh raw prawn, shells, or otak-otak (a grilled snack made of fish wrapped with banana leaves). I even saw a noodle and meatball cart in the hotel yard. Unfortunately, it is difficult to find restaurants in these tropical beaches. We only can find some canteens in the public beaches. However, if you come from other countries, it is better you eat in the hotel restaurants. Stroll along the beach looking for shells and build a sand castle are always be a must do activities for our family. We also found some hermit crabs hiding in the corals. 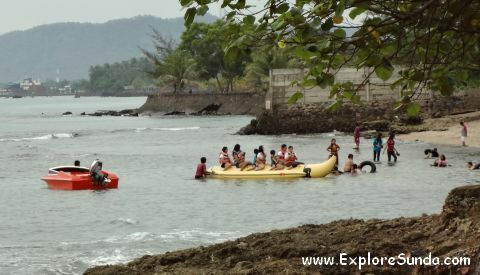 Water sports, such as banana boat and jet ski, are the top favorite things to do here. We can find many operators along the way, some works in public beaches and others offered through hotels. 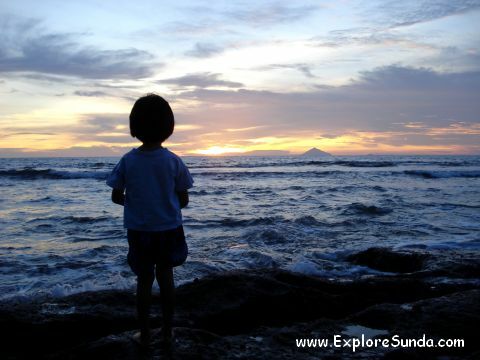 Sail to Anak Krakatau (Krakatoa's son), the active volcano in Sunda strait. We can go hiking and diving there. It has a beautiful coral reef. We can find the speedboat for rent at hotels, carita beach or Labuan, a small harbor town southern Carita beach. Relax our body by taking a spa treatment at the hotel. Some of them also offer spa treatment in a gazebo overlooking the sea. Shopping at the weekend market next to Patra Jasa hotel. It is not a big market nor a permanent one though, it only consists of several t-shirt and beach sarong stands. Alternatively, we can go to the public beaches, where we can find vendors selling beautiful shells and local fruits such as banana and soursop. Finally, at the end of the day, let's relax and enjoy the sunset. When it is not cloudy, we can see Anak Krakatau, the still active volcano in Sunda strait, in the horizon. Driving from Jakarta, go to Jakarta-Tangerang toll road. This is the first section of Jakarta-Merak toll road. You only need to follow this road for 95 kilometers. We must pay a couple of toll fees until we exit at West Cilegon. This is the last exit before we reached the end of the toll road at Merak harbor. 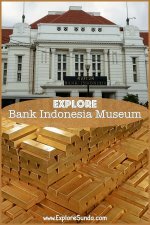 Once we leave the toll road, we must pay attention to the road signs leading to Anyer, otherwise we will waste our time wander in the town of Cilegon. Along the way we will pass Krakatau Steel, Indonesia’s leading steel company, then the chemical industrial park. Unfortunately, the road is not suitable for big trucks these companies use. Thus, this section of the road is always damaged all year long, dusty during dry season and muddy during rainy season. It will take some time to pass it. But after that, the road is in good condition, you only need to follow it until you see the lighthouse in front of you. 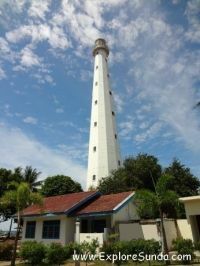 The lighthouse is the landmark of Anyer beach. Driving forward, you will pass public beaches and hotels. Most of them are on your right side, where the beach and the sea are. Due to its proximity to Jakarta and industrial park in Cilegon, Anyer and Carita beach are favorite weekend destinations. But, I always love to come on weekdays, because they are less crowded and cheaper. It’s better you avoid long weekends and national holiday, because the road will be jammed, beaches will be very crowded and everything will be very expensive. So, when you have a one or two spare days, why don't you visit these tropical beaches and have fun!